Shopping online for jewelry can be chaotic. With such a wide variety of choices, it can be difficult to find a ring that speaks to your individual sense of style. Luckily, JustMensRings.com specializes in supplying rings that are nothing short of extraordinary. Our men’s black titanium wedding ring with two satin bands is an excellent example. This ring provides the best of both worlds, with brushed silver titanium strips set against a black titanium band for a two-toned effect. Best of all, titanium is tough enough to withstand the wear and tear of demanding jobs, workouts at the gym, and so much more. Titanium is resistant to corrosion, denting, discoloration, and tarnishing, but that’s not all. This lustrous metal boasts the highest strength-to-weight ratio of any transition metal. Feel and look your best on the big day and every day thereafter by choosing our 8mm men’s black titanium wedding ring with two satin bands. The modern groom deserves a wedding band that is as unique as the bond he shares with his soon-to-be-spouse. With our men’s black titanium wedding ring with two satin bands on your finger, you will always know you made the right choice. Brushed titanium looks sleek and sophisticated for work or any kind of occasion worth dressing up for. 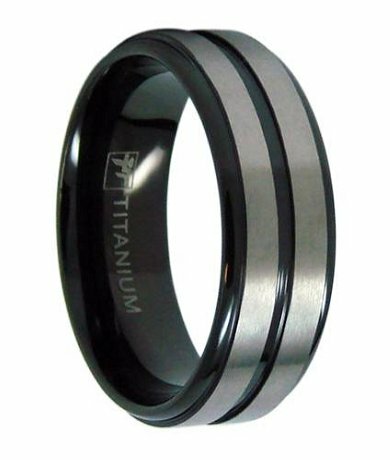 We designed the 8mm men’s black titanium wedding ring with two satin bands in the comfort-fit style. Comfort-fit rings usually measure a half size smaller than traditional wedding bands. We recommend that you visit your local jeweler to have your finger sized for accuracy. Have questions? Contact us today to learn more!